In a study2 evaluating these risk factors, cats that consumed canned food had a 3.6× increased risk for oral SCC, while those that consumed canned tuna had a 4.7× increased risk. The proposed mechanism for this association has been an increased rate of dental disease or differences in food content, but further studies are needed. Common clinical signs of FOSCC may include inappetence or dysphagia, halitosis, increased drool or oral discharge, or blood present in the food or water dish. Signs, such as weight loss, decreased grooming, or increased hiding, may be subtle and nonspecific. FOSCC can arise in the sublingual area, lips, maxilla, or mandible (Figures 1 to 3) and behaves in a locally aggressive fashion, with extensive tissue invasion, including invasion of adjacent bone. FIGURE 3. Large maxillary lesions (A and B); histologically confirmed as squamous cell carcinomas. Skull radiography can be performed but is limited by superimposition of tissues and the need for heavy sedation or anesthesia. CT proves more informative, if available, because it can show the extent of disease for treatment planning (surgery or radiation) (Figure 7). Including the thorax in the CT examination is recommended to evaluate for possible pulmonary metastatic disease. Most important, if radiation therapy is a treatment consideration, the CT scan should be obtained at the same facility where treatment will be administered because CT may be required for radiation planning and set-up. FIGURE 7. Computed tomographic scan in a cat with a proliferative right maxillary mass, histologically confirmed as feline oral squamous cell carcinoma. This cat was treated with hypofractionated palliative radiation therapy. Assess for bone invasion and possible extension into the lymphatics, including the tonsils. A punch or wedge biopsy may be completed under the same sedation as the oral examination, although complications, including jaw fractures, delayed wound healing, or secondary infection, may result from the often friable and necrotic nature of this tumor. Samples should not be taken from the center of a lesion, where necrosis is most likely to be present, due to the potential for obscured histopathologic results. In addition, ideally the biopsy should be completed in such a way that the biopsy tract can be removed or treated with local therapy; for example, a biopsy should not be taken through the lip if that area is not otherwise involved. Owners should be counseled about the risk for an increase in oral discharge or hemorrhage as a result of the biopsy procedure. Occasionally, fine-needle aspiration is sufficient for diagnosis and can be attempted before biopsy. Malignant squamous cells can be distinguished from normal squamous epithelium by the retention of nuclei and more pronounced anisocytosis and anisokaryosis. Inflammatory cells may or may not be present. In the case of severe inflammation, normal squamous cells can undergo dysplastic changes that may mimic neoplastic changes, which is one of the reasons biopsy is recommended. Surgery is considered first-line therapy for most local cancers, including FOSCC. Surgical management of FOSCC faces many challenges, including the commonly occurring sublingual location, invasion of bone, late detection, and advanced tumor stage. Surgical excision to achieve adequate surgical margins, or even to resect gross disease, is usually limited given the small stature and anatomy of the cat skull. Furthermore, unlike dogs, cats do not tend to tolerate aggressive oral surgery without significant morbidity. 41% required placement of enteral (esophageal) feeding tubes. The overall complication rate in the acute setting was 98%, while 78% of cats had long-term side effects; complications included tongue protrusion, ptyalism, mandibular drift, and difficulty grooming, in addition to the previously mentioned dysphagia and inappetence (Figures 8 and 9). Despite these risks, 83% of owners were pleased with the outcome and stated that they would pursue mandibulectomy again. In this study, cats with FOSCC had a decreased median survival time compared with cats that had other tumor types (217 days versus median not reached in cats with fibrosarcoma or odontogenic tumors). The role of postoperative radiation therapy is to sterilize or slow the growth of residual microscopic disease that often remains after surgical resection of even the smallest tumors. Unfortunately, FOSCC is often locally advanced at time of diagnosis; as a result, surgery is not a viable option for most affected cats. Owners should be adequately counseled about the risk for postoperative complications when surgery is being considered. CT and consultation with a soft tissue or oral surgeon are useful to help determine whether surgery is feasible in a particular patient. When surgery is not pursued due to anatomic limitations or owner preference, radiation therapy can usually be considered. Palliative courses are shorter with less frequent treatments. Palliative-intent radiation therapy has the primary goal of alleviating pain and clinical signs associated with the tumor rather than sterilizing a maximum number of cancer cells. Disease regression or extending patient survival is not necessarily expected, although alleviation of clinical signs and discomfort can inherently lead to increased survival times. With definitive-intent radiotherapy, early radiation side effects, such as mucositis and moist desquamation, are more prevalent, while late side effects, such as fibrosis, bone necrosis (osteoradionecrosis), and cataracts, are rare. With palliative-intent radiotherapy, the incidence of early side effects is low, which is in line with the palliative goal of the treatment. While the risk for late-term side effects may be increased in this setting, these complications are generally expected to occur beyond the anticipated survival of the patient. Interestingly, in our clinical experience, cats generally appear to have a higher tolerance for radiation than dogs. Given similar radiation treatments, the risk for early or late effects in cats is lower than that in canine patients. Due to the combination of hypoxia and necrosis in most tumors, SCC is considered relatively radioresistant, with decreased responsiveness to radiation.7,16 In addition, rapid cell proliferation/regrowth has been noted between radiation treatments, contributing to poor long-term tumor control. Various definitive protocols have been investigated, including accelerated radiation delivery, but despite attempts to optimize radiation schedules, definitive radiation has failed to achieve a significant survival benefit.16-22 Given the aggressive nature of FOSCC and poor responsiveness to definitive radiation, the focus of radiotherapy often centers on palliation in most cats. At our institution, the typical palliative protocol involves 4 fractions of 8 Gray given once weekly to a total radiation dose of 32 Gray. The 1-week interval between fractions allows the mucosal lining of the oral cavity and external skin to heal, minimizing early side effects. The overall median survival time for this protocol was 174 days. Cats with T1 lesions (n = 4) had a favorable median survival time of 590 days. 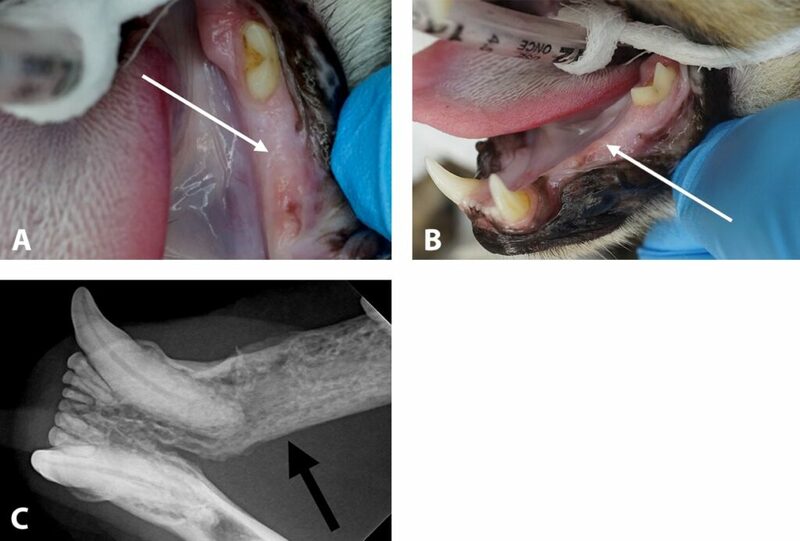 All cats experienced grade 2 oral mucositis secondary to radiation therapy (defined as patchy mucositis with patient seemingly pain free23), which was effectively managed with oral antibiotics and pain medications. All patients prophylactically received esophageal feeding tubes for management of early radiation side effects. For most cats with FOSCC, palliative radiotherapy is a logistically feasible treatment approach associated with minimal side effects. Unfortunately, clinical benefit is achieved in only about half of patients and is short-lived in most animals that respond favorably. Toceranib phosphate (Palladia, zoetisus.com) is a small-molecule inhibitor that targets receptor tyrosine kinases, including C-kit, vascular endothelial growth factor receptor, platelet-derived growth factor receptor, and Flt-3. Tyrosine kinase receptors are transmembrane receptors that control downstream cellular functions, such as replication, growth, differentiation, and angiogenesis. Those that received toceranib phosphate had a longer median survival time (145 days versus 45 days). Of those that responded to toceranib phosphate (with response defined as stable disease or better), median survival time was 201 days. Anorexia was the most common adverse event, occurring in 70% of cats. Most anorectic episodes were transient and mild, and no cats required medical intervention. Other reported adverse events included afebrile, low-grade neutropenia; elevation of liver enzymes; and progressive azotemia. A major limitation and potential confounding factor of this study was the allowance of nonsteroidal anti-inflammatory drugs (NSAIDs) in both the treatment and control groups. Progressive azotemia was seen only in patients receiving concurrent toceranib phosphate and NSAIDs; therefore, the contribution of each medication is difficult to elucidate. Further studies are needed to determine whether toceranib phosphate, alone or in combination with chemotherapy or radiotherapy, has a role in the treatment of FOSCC. Potentially, anticancer effects, such as disease response or stabilization. No studies have assessed the response of FOSCC to NSAIDs alone, although in one study NSAID use was associated with a 2-fold reduction in the hazard ratio for death.29 Clinical experience suggests that, while NSAID use may have a short-lived palliative effect in some cats with FOSCC, significant tumor responses are not observed. In our opinion, cats with FOSCC are good candidates for meloxicam. As previously stated, using this medication has many potential benefits, especially increase in patient comfort. These patients are more likely to die of FOSCC progression than of renal disease. Of course, the risks and benefits of every medication should be assessed on an individual patient basis and thoroughly discussed with the pet owner. Other oral medications can be used to increase patient comfort and control clinical signs of disease. Oral antibiotics may help treat infections of tumor tissue secondary to normal oral flora, which can cause increased clinical signs and often be mistaken for disease progression. In general, antibiotics that penetrate bone and/or have anaerobic spectrum activity, such as doxycycline, amoxicillin trihydrate/clavulanate potassium, and clindamycin, are recommended. As tumors progress and grow in size, cats may have progressive anorexia and dysphagia due to difficulty with prehension, discomfort, or both. As previously discussed, mucositis secondary to radiation therapy can also contribute to these side effects. Feeding tubes are sometimes considered to support cats with FOSCC. A complete discussion of parenteral feeding options is beyond the scope of this text, but esophageal feeding tubes are generally the most commonly used given the relative ease of placement and client use. In our opinion, feeding tubes should be considered only for transient use to manage treatment side effects. Difficulty eating due to the oral tumor itself indicates that the disease is negatively affecting the patient’s quality of life. Given the overall poor prognosis and the lack of effective treatment options, humane euthanasia should be considered at this point. Despite the availability of therapeutic options, including radiotherapy, chemotherapy, and toceranib phosphate, the prognosis for FOSCC remains poor. Most cats present with advanced (T2 or greater), nonresectable local disease, and treatment is generally ineffective or associated with a short-lived tumor response. Median survival times range from 2 to 5 months. 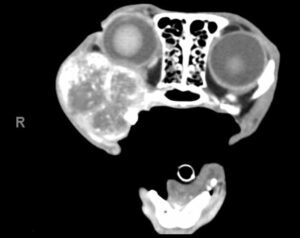 Cats with small tumors, especially those located in the rostral mandible that are amenable to surgical resection, may have improved outcomes. Adjuvant definitive radiotherapy may delay tumor recurrence in that setting. As new treatments become available, multimodal therapy, including combinations of local therapy, chemotherapy, and medical therapy, may prove beneficial for this uniformly aggressive disease and should be evaluated in future studies. Withrow SJ, Vail DM, Page RL. Withrow & MacEwen’s Small Animal Clinical Oncology, 5th ed. Philadelphia: Elsevier Saunders, 2013, pp 389-395. Bertone ER, Snyder LA, Moore AS. Environmental and lifestyle risk factors for oral squamous cell carcinoma in domestic cats. J Vet Intern Med 2003; 17(4):557-562. Snyder LA, Bertone ER, Jakowski RM, et al. p53 expression and environmental tobacco smoke exposure in feline oral squamous cell carcinoma. Vet Pathol 2004; 41(3):209-214. Munday JS, Howe L, French A, et al. Detection of papillomaviral DNA sequences in a feline oral squamous cell carcinoma. Res Vet Sci 2009; 86(20):359-361. Bilgic O, Duda L, Sánchez MD, Lewis JR. Feline oral squamous cell carcinoma: Clinical manifestations and literature review. J Vet Dent 2015; 32(1):20-40. Vogel DWT, Zbaeren P, Thoeny HC. Cancer of the oral cavity and oropharynx. Cancer Imaging 2010; 10(1):62-72. Soltero-Rivera MM, Krick EL, Reiter AM, et al. Prevalence of regional and distant metastasis in cats with advanced oral squamous cell carcinoma: 49 cases (2005–2011). J Fel Med Surg 2014; 16(2):164-169. Cowell RK, Tyler RD, et al. Diagnostic Cytology and Hematology of the Dog and Cat, 3rd ed. St. Louis: Mosby Elsevier, 2008, pp 140-143. Skinner OT, Boston SE, Souza CH. Patterns of lymph node metastasis identified following bilateral mandibular and medial retropharyngeal lymphadenectomy in 31 dogs with malignancies of the head. Vet Comp Oncol May 2016 [epub ahead of print]. Williams LE, Packer RA. 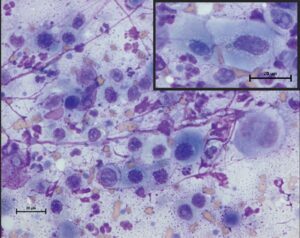 Association between lymph node size and metastasis in dogs with oral malignant melanoma: 100 cases (1987–2001). JAVMA 2003; 222(9):1234-1236. Savary KC, Price GS, Vaden SL. Hypercalcemia in cats: A retrospective study of 71 cases (1991–1997). J Vet Intern Med 2000; 14(2):184-189. Hutson CA, Willauer CC, Walder EJ, et al. Treatment of mandibular squamous cell carcinoma in cats by use of mandibulectomy and radiography: Seven cases (1987–1989). JAVMA 1992; 201(5):777-781. Northrup NC, Selting KA, Rassnick KM, et al. Outcomes of cats with oral tumors treated with mandibulectomy: 42 cases. JAAHA 2006; 42(5):350-360. Fiani N, Arzi B, Johnson EG, et al. Osteoma of the oral and maxillofacial regions in cats: 7 cases (1999-2009). JAVMA 2011; 238(11):1470-1475. Lascelles BD, Henderson RA, Sequin B, et al. Bilateral rostral maxillectomy and nasal planectomy for large rostral maxillofacial neoplasms in six dogs and one cat. JAAHA 2004; 40(2):137-146. Evans SM, LaCreta F, Helfand S, et al. Technique, pharmacokinetics, toxicity, and efficacy of intratumoral etanidazole and radiotherapy for the treatment of spontaneous feline oral squamous cell carcinoma. Int J Rad Onc Bio Phys 1991; 20(4):703-708. Sabhlok A, Ayl R. Palliative radiation therapy outcomes for cats with oral squamous cell carcinoma (1999-2005). Vet Radiol Ultrasound 2014; 55(5):565-570. Fidel JL, Sellon RK, Houston RK, Wheeler BA. A nine-day accelerated radiation protocol for feline squamous cell carcinoma. Vet Radiol Ultrasound 2007; 48(5):482-485. Fidel J, Lyons J, Tripp C, et al. Treatment of oral squamous cell carcinoma with accelerated radiation therapy and concomitant carboplatin in cats. J Vet Intern Med 2011; 25(3):504-510. Bregazzi VS, LaRue SM, Powers BE, et al. Response of feline oral squamous cell carcinoma to palliative radiation therapy. Vet Radiol Ultrasound 2011; 42(1):77-79. McDonald C, Looper J, Greene S. Response rate and duration associated with a 4Gy 5 fraction palliative radiation protocol. Vet Radiol Ultrasound 2012; 53(3):358-364. Poirier VJ, Kaser-Hotz B, Vail DM, Straw RC. Efficacy and toxicity of an accelerated hypofractionated radiation therapy protocol in cats with oral squamous cell carcinoma. Vet Radiol Ultrasound 2012; 54(1):81-88. LaDue T, Klein MK. Toxicity criteria of the veterinary radiation therapy oncology group. Vet Radiol Ultrasound 2001; 42(5):475-476. London C, Mathie T, Stingle N, et al. Preliminary evidence for biologic activity of toceranib phosphate (Palladia) in solid tumors. Vet Radiol Ultrasound 2012; 10(30):194-205. Wiles V, Hohenhaus A, Lamb K, et al. Retrospective evaluation of toceranib phosphate (Palladia) in cats with oral squamous cell carcinoma. J Fel Med Surg 2016 [epub ahead of print]. Olmsted GA, Farrelly J, Post GS, Smith J. Tolerability of toceranib phosphate (Palladia) when used in conjunction with other therapies in 35 cats with feline oral squamous cell carcinoma: 2009-2013. J Fel Med Surg 2016 [epub ahead of print]. Harper A, Blackwood L. Toxicity and response in cats with neoplasia treated with toceranib phosphate. J Fel Med Surg 2016 [epub ahead of print]. Hayes A, Scase T, Miller J, et al. COX-1 and COX-2 expression in feline oral squamous cell carcinoma. J Comp Pathol 2006; 135(2-3):93-99. Hayes AM, Adams VJ, Scase TJ, Murphy S. Survival of 54 cats with oral squamous cell carcinoma in United Kingdom general practice. J Small Anim Pract 2007; 48(7):394-399. Gunew MN, Menrath VH, Marshall RD. Long-term safety, efficacy and palatability of oral meloxicam at 0.01-0.03 mg/kg for treatment of osteoarthritic pain in cats. J Fel Med Surg 2008; 10(3):235-241. Gowan RA, Lingard AE, Johnston L, et al. Retrospective case-control study of the effects of long-term dosing with meloxicam on renal function in aged cats with degenerative joint disease. J Fel Med Surg 2011; 13(10):752-761. Gowan RA, Baral RM, Lingard AE, et al. A retrospective analysis of the effects of meloxicam on the longevity of aged cat with and without over chronic kidney disease. J Fel Med Surg 2012; 14(12):876-881. Plumb DC. Plumb’s Veterinary Drug Handbook, 6th ed. Hoboken, NJ: Blackwell Publishing, 2008, pp 150-152. MacKenzie Pellin, DVM, Diplomate ACVIM (Oncology), is currently a radiation oncology resident at University of Wisconsin School of Veterinary Medicine. She previously completed a medical oncology residency at University of Wisconsin and a small animal rotating internship at Wheat Ridge Animal Hospital, Wheat Ridge, Colorado. Michelle Turek, DVM, Diplomate ACVIM (Oncology) & ACVR (Radiation Oncology), is an assistant professor of radiation oncology at University of Wisconsin School of Veterinary Medicine. She received her DVM from University of Montreal and completed residencies in medical and radiation oncology at University of Wisconsin. Michelle practiced at Angell Animal Medical Center in Boston and University of Georgia before returning to University of Wisconsin, where she works as a radiation oncologist, researcher, and instructor of oncology and communication. 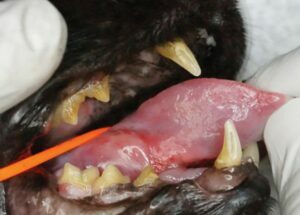 After reading this article, the practitioner should be able to recognize, diagnose, and stage feline oral squamous cell carcinoma; discuss treatment options and adverse events; and recommend specific treatment and management options to clients. The practitioner should also understand and be able to counsel pet owners regarding the prognosis. Feline oral squamous cell carcinoma is the most common oral tumor in cats. This article presents a basic overview for the general practitioner, including diagnosis, treatment options, and prognosis. Questions online may differ from those here; answers are available once the CE test is taken at vetmedteam.com/tvp.aspx. Tests are valid for 2 years from date of approval. Which of the following risk factors has NOT been associated with feline oral squamous cell carcinoma (FOSCC)? Which of the following clinical presentations should increase suspicion for FOSCC? Which of the following are the most appropriate staging tests for a cat with FOSCC? Which of the following is the least ideal method to obtain a diagnosis of FOSCC? Which of the following cats would be the best candidate for surgical resection of FOSCC? Which of the following is FALSE regarding complications of surgical resection of FOSCC? a. In one study, 12% of cats never regained the ability to eat on their own and 17 of 42 required esophagostomy tubes. b. It is uncommon to have incomplete margins when a tumor is resected. c. Common complications include mandibular drift, dysphagia, ptyalism, and difficulty grooming. d. Complications after surgery are common, with one study reporting an acute complication rate of 98%. Which of the following is TRUE regarding radiation therapy? a. Definitive intent radiation therapy protocols are associated with a high risk for early side effects and a low risk for late side effects. b. Palliative-intent radiation therapy protocols for FOSCC have resulted in survival times of 300+ days. c. Prolonged survival can be achieved with a 10-fraction radiation protocol regardless of tumor size. d. Cats are more sensitive to early radiation side effects compared with dogs. Which of the following is TRUE regarding chemotherapy for FOSCC? a. Chemotherapy is effective in FOSCC, with high response rates and improved survival. b. Toceranib phosphate should be used only for mast cell disease. c. A possible reason for FOSCC chemotherapy resistance is tumor necrosis leading to decreased chemotherapy delivery. d. Toceranib phosphate is not well tolerated in cats, with neutropenia reported as a common adverse event. Which of the following is FALSE regarding the use of nonsteroidal anti-inflammatory drugs for FOSCC? a. Cyclooxygenase (COX)-1 and COX-2 are upregulated in FOSCC. b. Upregulation of COX receptors has been associated with increased cellular growth, proliferation, and angiogenesis. c. Low-dose meloxicam has been evaluated in Europe and is associated with a high risk for progression of renal disease. d. Standard-dose meloxicam is associated with a “black-box” warning due to risk for renal toxicity. a. Oral masses can frequently become secondarily infected, and treatment with antibiotics should be considered. b. All patients with FOSCC should have a feeding tube placed for nutritional support. c. Buprenorphine must be injected via SC or IV route to be effective in cats with FOSCC. d. Nasogastric tubes are considered the best feeding tube option for FOSCC given the ease of placement, ease of use, and permanence of placement.